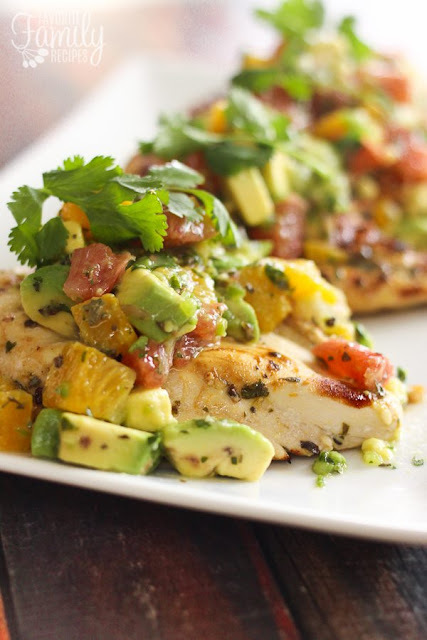 I actually had this citrus avocado chicken for the first time when I was visiting our Edwards cousins in Hawaii… they made it for us and I just HAD to get the recipe. Grilled Balsamic Chicken – This has been a go-to recipe of ours for years. The chicken is marinated in olive oil, balsamic vinegar, and Italian seasonings. It has so much flavor and always comes out tender, never dry. It is perfect for slicing and serving on a big, green salad. Wash and dry the limes, oranges, and grapefruit. Grate their zests and set aside for use in the marinade. Peel and section the citrus fruit, discarding the membranes, and reserve the juice for the marinade. Cut each citrus segment into three or four pieces and place in a large stainless steel mixing bowl with the remaining salsa ingredients. Mix and refrigerate until one hour before serving. Whisk the reserved citrus zest and juice with remaining ingredients. Rinse chicken breasts under cold water and pat dry with paper towels. Place in large plastic bag and pour in the marinade. Press out the air and seal tightly. Turn the bag to distribute the marinade, place in a bowl and refrigerate for 4-8 hours, turning occasionally. Cut the avocados into chunks and mix with salsa, Let sit at room temperature. 0 Response to "Citrus Avocado Chicken"